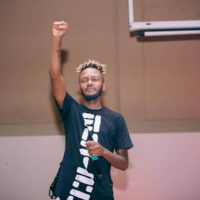 Kwesta whose real name is Senzo Mfundo Vilakazi is a South African rapper and songwriter born on 11 August 1988 in Katlehong, Ekurhuleni, Gauteng. He is signed to his own Independent and media company known as Rap Lyf with co-founder Kid X. He attended Phumulami secondary school for 3 years and later Alafang high school. At the age of 16, he dropped out of high school to pursue his music career. He was born on the 11th of August 1988 in Katlehong, Ekurhuleni, Gauteng. As of 2018, he is 30 years old. His wife is known as Yolanda Vilakazi, who had been his longtime girlfriend for over six years as of March 2017. Together they have a daughter named Khai, who was born on 13 October 2012.